How can the new boiler efficiency law fight boredom and help support energy control, monitoring and visualization systems in March 2014?? Usually, I tend to use blogs to highlight emerging technology trends in industrial energy efficiency. However, there’s a hot issue (no pun intended) that may be getting overlooked by many small-medium industrials who operate one of the 250,000 boilers covered by the new national emissions standards. The good news is, there are some high-technology solutions that can help with compliance and actually save operational costs after the new law becomes effective. The Clean Air Act (CAA), which now dates back over 40 years, has required the EPA to establish National Emissions Standards for Hazardous Air Pollutants (NESHAPS) for both “major sources” and “area sources” of hazardous air pollutants (HAPS) that are subject to regulation. In the past few years, there were some debates over new regulations surrounding industrial boilers, but those debates were resolved early in 2013 resulting in a March 2014 deadline. The national association of manufacturers points out that compliance with these standards could cost US manufacturers as much as $5B in capital and $1.5B a year in operating costs. The net cost of compliance, however, can be minimized if its handled correctly…The new standards are often referenced with the term “Boiler MACT”, which stands for “Maximum Achievable Control Technology”, and encourages the employment of control and visualization systems to not only allow the equipment to burn cleaner, but to consume less fuel in the process. So, it turns out boilers don’t have to be boring. Modern, automated control systems can be installed to optimize combustion based on emission components and other factors. Also, continuous monitoring of boiler statistics, such as boiler efficiency, specific energy consumption (SEC), and coefficient of performance (COP), can be linked to higher-level energy monitoring systems to associate with other consumption systems and put in context of production. By doing this, consumption trends can be identified and leveraged to lower overall energy costs, and degradation in performance can be quickly resolved-which streamlines maintenance procedures. Are you new to Boiler MACT? See the links below for a simple explanation. Are you ready for the new law? 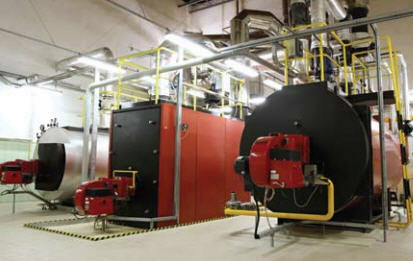 Boilers are one of the most popular tool to generate energy for industrial and domestic use. How a School District’s Broken Boiler Created Millions in Savings . . . and Transformed Classrooms Five Ways to Improve Energy Efficiency in your Process Why Today’s Robots Are Boring Why do you need to comply with ISO50001?